Chris and I were in San Francisco from September 8 to 13. Chris had to attend a conference for work starting the evening of the 8th and ending at noon on the 11th. I tagged along for a vacation. Whenever I travel, I always try to incorporate local fiber into my vacation. At a bare minimum, I visit a Local Yarn Store (LYS). I try to buy a yarn that is local, either because it is spun from locally raised fiber animal, it is hand-dyed locally, or it is manufactured by a small local business. I also look for textile museums or other points of fibery interest that I can visit. I rarely drag Chris to these places, as he generally finds them boring, but I take any opportunity to go on my own and bring Chris when the fiber can be combined with something he finds interesting. Since Chris was in the conference, I had two entire days on my own in San Francisco, and I used part of that time in fibery pursuits. On Friday, I did bring Chris along to one fibery exhibit. My fibery adventures barely scratched the surface of everything that is available in greater-San Francisco! In addition to checking out fiber, I had one other major plan for San Francisco: eating at Chez Panisse. This restaurant was founded in 1971 by Chef Alice Waters and friends. Alice Waters was one of the first to advocate for fresh, local, and organic foods. Over the years, she’s done tremendous work advocating for fresh, local, and organic not just in her restaurant, but also in partnership with schools and other programs. I first heard about Alice Waters and Chez Panisse when I was in high school. I don’t remember exactly when or how, but I know I stumbled across her work while I was learning about environmental issues. For 20+ years, I have wanted to eat at Chez Panisse, which is located in Berkeley. Chez Panisse has two sections: the downstairs restaurant and the upstairs cafe. The restaurant is open only for dinner and serves a set menu at a set price. The cafe is open for both lunch and dinner and the menu is a la carte. There’s some overlap between the restaurant and cafe menus. As a lifelong vegetarian, I knew I wanted to eat in the cafe rather than the restaurant, since the restaurant does not appear to offer a vegetarian meal option. I was able to get a reservation at 1:45 pm on Tuesday. I decided to spend the day in Berkeley. I googled independent bookstores and yarn stores, and got recommendations from some of my fellow HPKCHC Ravenclaws on other things to do, including visiting the skeletons in the Valley Life Sciences building on the University of California, Berkeley campus and the Lacis Textile Museum. A little yarn, a few books, a little science, lots of walking, and excellent food. This is pretty much my definition of a perfect day! We were staying in Union Square in San Francisco, in the hotel where Chris’s conference took place. To get to Berkeley, I took the BART (San Francisco’s subway) from the Powell Street Station, located 4 or 5 blocks from our hotel, to the Berkeley stop. The ride is about 30 minutes. Chez Panisse is 9 blocks from the Berkeley BART stop. I planned my route through Berkeley to maximize my time and put me in the vicinity of Chez Panisse at the time of my reservation. First, I went to Pegasus Books. This store has four features that, in my mind anyway, are nearly a guarantee of an excellent bookstore: (1) Carts of used books for $1 each, located just outside the open doors of the store; (2) Two store cats sleeping in random locations; (3) Piles of used books randomly around the store for you to dig through; (4) Very comfortable couches in one corner for chilling and extra seating scattered around the shop for convenient sitting while examining books. I picked up a few used books and one new book, none of which are fiber related. Next, I went to the Valley Life Sciences Building. In addition to holding the classrooms, labs, and libraries for the various biology departments of UC Berkeley, this building is home to three museums: Museum of Paleontology, Museum of Vertebrate Zoology, University and Jepson Herbaria. These are research facilities and not open to the public. However, these museums and the Entomology department have displays along the corridors on the first and second floors. You do not need a University ID to enter the building, so these displays are open to anyone who wants to see them. I spent a little time wandering the corridors and viewing all the available collections. I was particularly fascinated by the Entomology specimens, as many were labeled with the date they were collected and some had dates as far back as 1913 and 1928! They were in excellent condition and, if they had not been labeled, I never would have guessed their age. It was time to start meandering towards Chez Panisse. I had two stops planned along the way. The first was another bookstore: Bookish. This is a long, narrow bookstore that has a lot more books in it than you would guess from the facade! I picked up a few more books and then headed to my next stop, a yarn shop! I chose to visit Claddagh Yarns because it is around the corner from Chez Pannise. I arrived 1.5 hours before my reservation, planning to poke around in the yarn and then knit for a while. I absolutely fell in love with the shop. Claddagh Yarns opened in September 2013, and it is clear that in the short time since the shop opened the owner, Amanda, has successfully built a community in the shop and in the neighborhood. The shop isn’t large, but it is inviting and modern, with a gray concrete floor and shiny white furnishings. The yarn is on shelves lining the walls, organized by weight. The center of the shop is a white table seating at least eight. When I walked into the shop, four or five women, including Amanda, were seated at the table knitting, chatting, or trouble-shooting projects. Amanda greeted me and, when I asked, pointed me in towards the local yarns. I ended up buying a skein of Sincere Sheep‘s Diaphanous lace weight yarn (80% merino, 20% silk) in Vit C, a colorway that reminded me of the Golden Gate Bridge. 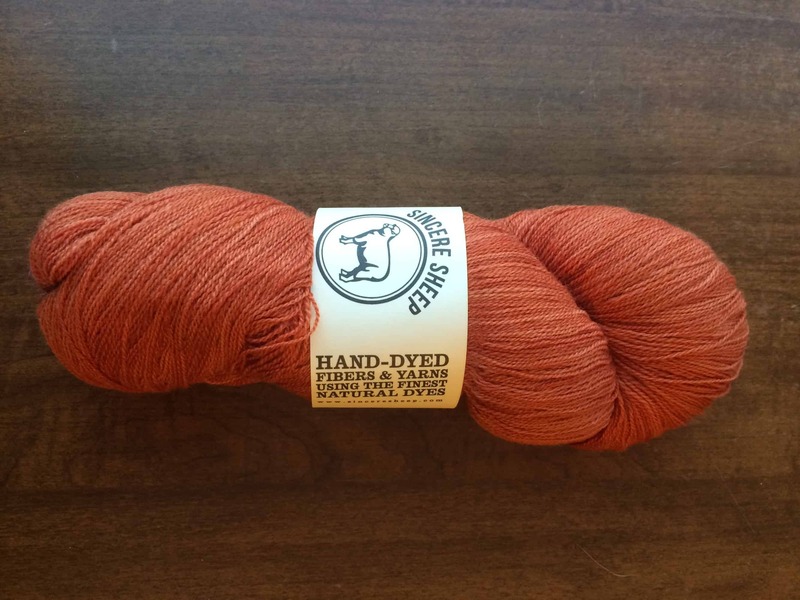 Sincere Sheep is located in Napa Valley and uses natural dyes. I haven’t decided what I will knit with the yarn, but it will need to have some sort of California connection! After buying yarn, I sat and knit on MAPLE LEAF the Sixth for a while. I immediately felt a part of the place. A group of elementary school students walked by the shop and several kids popped their heads in the door to wave to Amanda. They were part of a Waldorf School that takes classes from Amanda. One of the other people hanging out in the shop was Lauren. I spent a while talking to her about reverse engineering the blanket from Chris’s layette. Unfortunately, I didn’t have the blanket with me, but I’m fairly certain that it is knit in one piece even though it has two colors, and that accomplishing this uses techniques I do not know. Lauren helped me hash out some of the possibilities. When it came time to leave for lunch, I was sad to leave. Tuesday happens to be knit night (6 pm – 9 pm) at Claddagh Yarns, and I initially planned to go back and spend the evening. Unfortunately, by 5 pm, I had walked two miles away and the time change was catching up with me; between these two factors, I was exhausted. I went back to my hotel and spent the evening there. I loved my time at Claddagh Yarns. If I ever make it back to Berkeley, I will definitely spend some time hanging out there and if you find yourself in the neighborhood, I highly recommend a visit! Chez Panisse was everything I thought it would be. I had 4 appetizers: roasted tomato & eggplant soup, little gems lettuce with roasted beets and green goddess dressing, a green salad that included watermelon radishes sliced so thin you could see through them, and baked andante dairy goat cheese with garden lettuces. My entree was house made rigatoni with a mushroom rag out. I ordered the appetizer portion rather than the dinner portion! For dessert I had a bittersweet chocolate custard with chantilly cream and an almond cracker. Every mouthful of food was exquisite and it all looked beautiful on the plate. Chez Panisse requests that you not use your phone or computer at the table, so I did not take any pictures of the food. Overall, it was a fabulous eating experience, and worth every single penny of the $90 (including gratuity and taxes) bill. Cakes and Purls is located not far from the Berkeley BART stop, and I had walked past its street on my way to Pegasus Books. However, the shop did not open until noon, so I did not stop by earlier in the day. I wanted to stop at this shop because who can resist a combo bakery & yarn shop? Certainly not me! After lunch, I walked the 9 or 10 blocks from Chez Panisse to Cakes and Purls, only to discover a sign on the door saying they were closed for the day due to staff illness. From what I could see through the door, it looks like a cute place. The bakery is on the left side of the store. The yarn area, complete with comfy couches, is on the right side of the store. I’m sorry I wasn’t able to visit. Lacis is next door to the Ashby BART stop, a little more than a mile from Cakes and Purls. I could have hopped on BART at the Berkeley stop and gotten off in one stop, but it was a beautiful day (in the low or mid 70s Fahrenheit) and I was on the phone chatting with my mother and sister, so I decided to walk rather than take BART. By the time I got to Lacis, having now walked 2 miles from Chez Panisse and with the books I purchased earlier weighing down my messenger bag, I was tired. When I walked in the door, I was also confused. I expected a museum, but what I found was a retail store. It is a huge and fascinating retail store, but a retail store nonetheless. The store consists of three separate rooms, selling a wide variety of tools and materials for creating lace as well as embellishments and finished products. When I inquired after the smocking exhibit advertised on Lacis’s website, I was told that it was only open on Saturdays or by prior appointment. Since the website says the hours are 12 – 6 Monday through Saturday (the retail hours), I was not aware that a special appointment was needed for the exhibit and had not made one. As a result, I was unable to view it. As I wandered around the store, I discovered some exhibits tucked in here and there, but I found them by accident as they weren’t labeled as exhibits. The first exhibits I found were in the main room of the store, on the right hand wall, and consisted of many examples of lace in different styles, housed in the kind of flip-through plastic displays that many stores use for displaying posters. The lace pieces were organized based on the technique used to create them. The pieces were mostly from the first half of the 20th century, but a few were older. Each piece was labeled with its date, technique, and provenance. The exhibit also included brief descriptions of the different techniques for lace creation. After I found this display, I made sure to check the other flip-through plastic displays in the room, but they held items for sale. It is important to look up in this store. Interesting textiles are hanging from the ceiling and from the walls, above the displays. The main room of the store also included an impressive collection of books for sale. It is the largest collection of fiber books I’ve ever seen for sale in one place. The books are topically organized, and include technique, pattern, and reference books on fashion, costuming, and textile history in addition to craft-specific books. The craft-specific books are not limited to lace. The knitting section included everything from stitch pattern books to felting to socks to lace. I spent a long time browsing the books, but ultimately did not buy anything. I was so tired and overwhelmed at that point that I couldn’t winnow down to one or two books, so left them all! The second room of the store displayed finished textiles, buttons, pins, and other small embellishments. Almost everything in this room was for sale, but dresses and other textiles hung from the walls above the sale displays. A velvet rope was hanging across the doorway between the second and third rooms. In order to enter the third room, a staff person had to accompany me. This third room is the bridal room. Breathtakingly beautiful vintage veils hang from the walls above the displays. Bolts of lace, sold by the yard, line one wall. A sign on the wall lets you know that Lacis will make veils to order. Even though Lacis was not what I expected, I enjoyed my visit. It is exactly the kind of unique local place that I like to search out when traveling. The Exploratorium is a science museum, but that appellation does not do it justice. It is the most amazing science museum I have ever visited. Every exhibit is interactive. It is not a place you walk through reading plaques. It is a place where you explore and experiment. I spent the first 15 minutes I was there watching water freeze. In this exhibit, which was part of an area about weather phenomenon, polarized magnifying glasses are attached to the edges of a cold table. You use a sprayer to melt the ice that is already on the cold plate and use the magnifying glasses to watch the water freeze.. It was awesome! The ice crystals grow from the edge of existing ice crystals. You think nothing is happening, then you blink and suddenly there’s this feathery ice where none existed. I took a 10 minute video through one of the magnifying glasses, and somehow my phone oriented it in portrait, even though I was holding the phone in landscape. I’m embedding it here for you anyway because I think it is so awesome to see water freeze like this! I did not expect to encounter any fibery goodness in a science museum. However, one section of the Exploratorium is called “Tinkering.” This exhibit is about building things, making small changes, and seeing what happens. None of the interactive exhibits involve fiber, but fiber showed up here nonetheless. First, I ran across a vending machine that sold small components for tinkering. Conductive thread was one of the items in that vending machine! 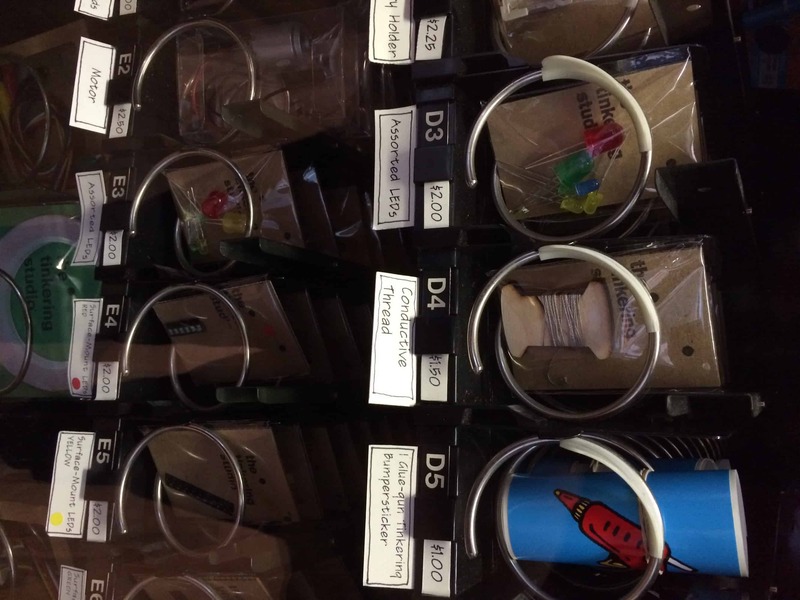 Where else will you find conductive thread in a vending machine?! The center of the Tinkering area is a huge lighted display case called the Cabinet of Curiosities. Items on display are ingenious contraptions, many (perhaps all?) of which you can make yourself following directions in the Exploratorium’s book, The Art of Tinkering . This display included a couple of knitted items. 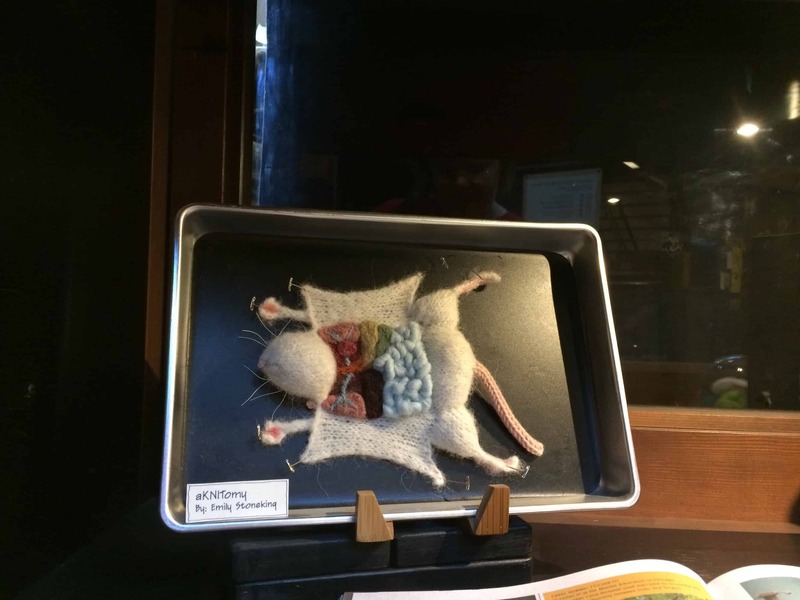 One item was a dissected rat, made from knitting and pinned to a tray. I knew I had seen this posted on Ravelry some time ago, so went looking for more information. It is designed by Emily Stoneking (Ravelry username CraftyHedgehog), and the pattern can be purchased on Ravelry. If you love this and want more, she also has patterns for a dissected alien, bat, fetal pig, earthworm, and frog. Her Etsy shop, aKNITomy, sells all of these patterns as well as completed knit dissections and knitted human art featuring knitted spinal cords, brains, and neurons. Ms. Stoneking also dyes yarn — with no anatomy or dissection references that I noticed — as North Atlantic Yarn Co. 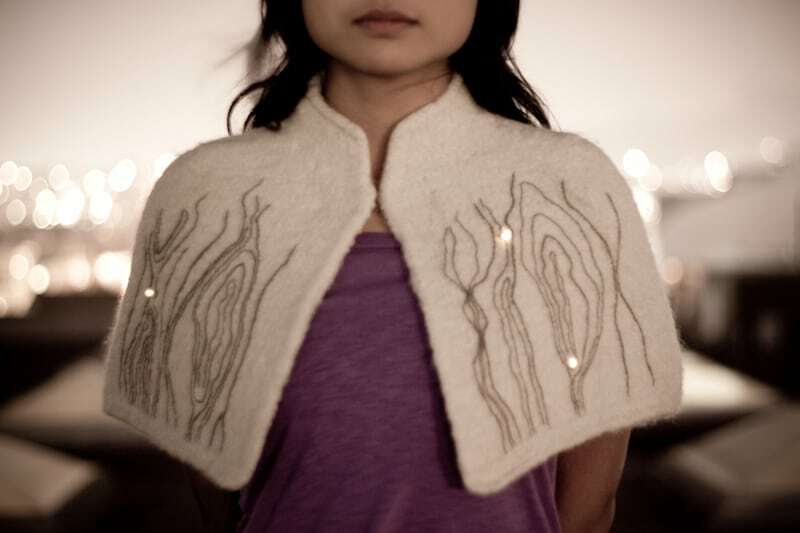 The Cabinet of Curiosities also included two pieces by Grace Kim, a textile artist who experiments with soft circuitry. Her pieces incorporate conductive thread, LED lights, and computer circuitry to light up parts of the work. Instructions for at least one of the pieces, a handbag, are included in the Art of Tinkering. I tried to find Ms. Kim on Ravelry, but did not find anything on her or these projects in patterns, designers, or even forum discussions. I took pictures of her pieces at the Exploratorium, but since they were on high shelves and behind glass I got all kinds of reflections, so the pictures aren’t worthwhile. These pictures are from Ms. Kim’s website, Soft Circuitry. The first of Ms. Kim’s pieces in the Cabinet of Curiosities is her Sessile Handbag. This bag was handknit and then felted. She then embroidered on the cotton barnacles. The LED lights are attached to the surface. Conductive thread embroidered into the fabric connects the lights to a LilyPad Arduino which is programmed so that the lights fade in and out. The second of Ms. Kim’s pieces in the Cabinet of Curiosities is a capelet she calls The Soft Electric, which she made as her graduate thesis. This piece is also hand knit and felted. 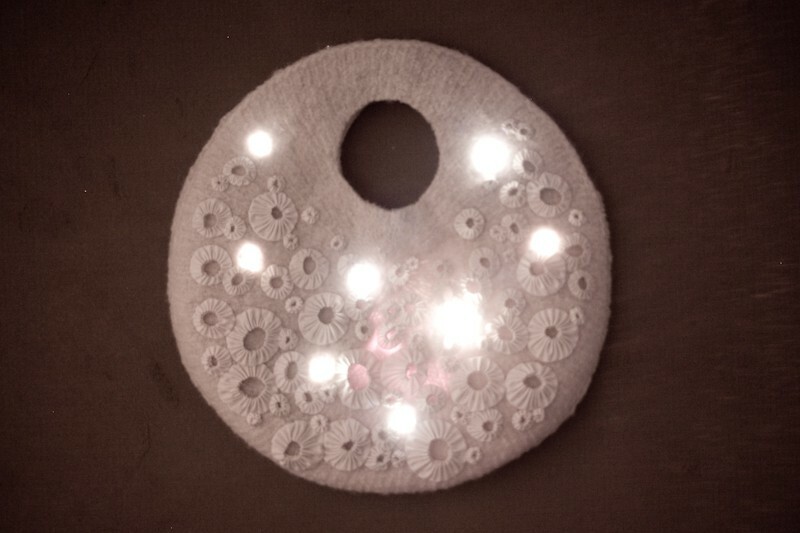 The LED lights are treated as beads and the embroidered pattern is made with conductive thread. I loved the work of both these women. I love to see people explore the boundaries of their craft. Fiber crafts have so many possibilities, and we should all push our own self-imposed crafting limitations, whether that’s by learning a new fiber art or a new skill within a craft we already do or by crafting with outrageous materials and forms! On Friday, Chris and I spent the day in Golden Gate Park. We spent most of our time at the California Academy of Sciences (a natural history museum), but we also spent a little time in the San Francisco Botanical Garden, followed by the de Young Museum (a fine arts museum). I wanted to go the the de Young Museum mostly because I saw on their website that their textile gallery currently houses a display of lace. 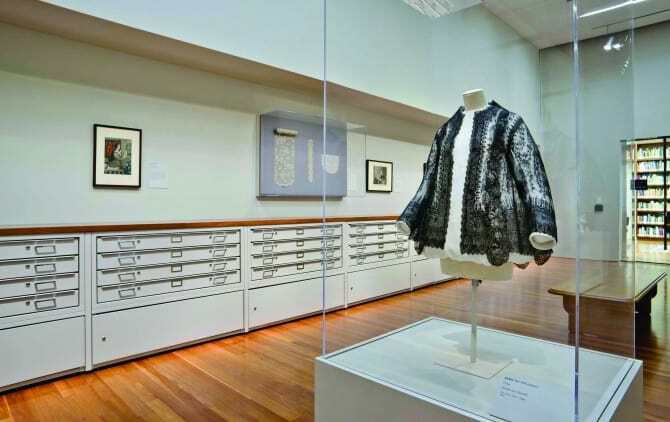 The textile section of the de Young consists of two galleries. The lace exhibit is in a small gallery and the exhibit is small, consisting of perhaps 10 pieces. In this picture, taken from the museum’s website, you can see about half of it! I was disappointed in the exhibit itself, especially since I had been to Lacis just a few days before. While the plastic displays at Lacis seemed odd to me, that compact displayed contained far more individual pieces, styles, and description than the more standard exhibit at the de Young Museum. The coolest part about the de Young was the drawers you see lining the wall. Each drawer contains a piece (or pieces) of textile. These pieces are not part of the lace display. They span a wide range of fabric creation techniques, including lace, knit, and woven pieces. I was particularly interested in the drawers towards the back of the gallery as these contained several swatches of basic weaving drafts. The main textile gallery at the de Young was occupied by Lines on the Horizon: Native American Art from the Weisel Family Collection. A few hand drawn works were included in the exhibit, but it was mostly pottery and woven pieces, all exploring the use of lines in Native American Art. I spent a good deal of time examining the weaving in this gallery. The pieces were all Navajo blankets and serapes dating from the late-19th and early-20th centuries. 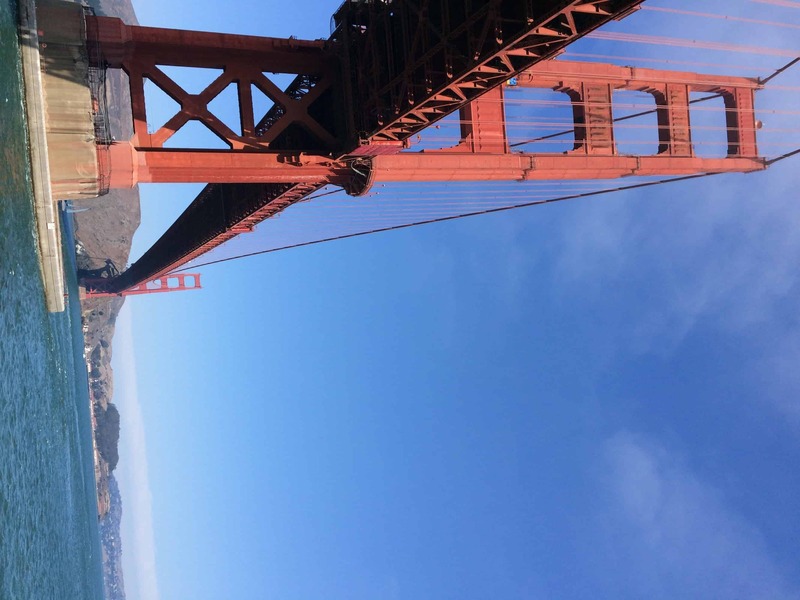 I had a wonderful time in San Francisco. The fiber exhibits and shops I was able to visit only scratch the surface of the fibery goodness available in this city. I would love to hear about your visits to other yarn shops or exhibits in San Francisco! Share them in the comments below.